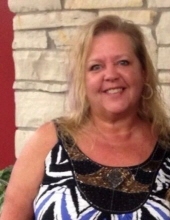 Teresa Ann “Teri” Crang 55 of Clinton, Il. passed away 10:55 A.M. October 14, 2018, at her family residence. Celebration of Life will be 12 Noon, Monday, October 29, 2018, at the Kenney Community Center, Kenney, IL with Ernie Harvey, Jr. officiating. Calvert Funeral Home, Clinton, IL, has assisted the family with cremation rites. Memorials may be directed to the Teri Crang Memorial Fund. Teri was born April 22, 1963, in Clinton, IL the daughter of James and Rani (Crang) Staton. Survivors include her mother, Rani Crang, Clinton, IL; father, James Staton, El Paso, IL; sisters, Wendy (Tony) Hieronymus, Clinton, IL; Jamee (Chuck) Jester, Kenosha, Wisconsin; aunts: Candy Crang, Kenney, IL and Cathy Clark, Kenney, IL; special niece, Kameron Jester; and best friend and chosen sister, Robin McFeeters, Macon, IL. She was preceded in death by her brother, Blake E. Staton. Teri enjoyed spending time with her family and friends and her beloved dog, Charlie.